Interior of the Wellcome Library. ﻿﻿﻿﻿﻿﻿﻿﻿ The Wellcome Library’s art deco reading room, formerly the original museum for Henry Wellcome’s unique collection, has a frieze around it containing names, thought in the 1960s to be the most important figures in medicine. The library serves to fill the gaps between those names, the lesser known doctors, nurses, surgeons, other medical practitioners, patients and theorists. Contrary to many misconceptions, the collection held is very much alive and glowing with a wealth of diverse material (2.5 million items! ), spanning themes as broad as; food, ethics, sexuality, medicine in the media, foreign language material, alchemy, botany, witchcraft and the occult and much more. There are twelve books about Napoleon’s various alleged maladies (including scabies), a huge variety of periodicals and primary source medical textbooks from 1850 onwards and vast numbers of paintings, drawings and prints. The library is open to anyone, and there is only one category of membership. The main readership is students (of both medicine and art/art history), people in the field of medicine, and family historians who can look up family members who were patients, or doctors, nurses and other medical practitioners. The library has its own in-house conservation team where most of its conservation takes place, an in-house photography team for digitisation (a current digitisation project looking at the history of genetics is currently underway) and a Rare Materials Room for consulting the more fragile and rare material, the oldest of which is a prescription from Egypt dated 11BC. 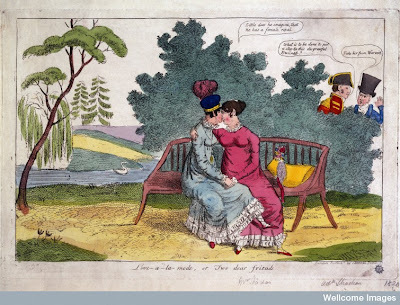 The Research and Engagement Officer Ross MacFarlane told us about the Wellcome’s online presence, including the blog, Wellcome Images, a widely used free resource, the video tutorials for library users, and Wellcome Film. 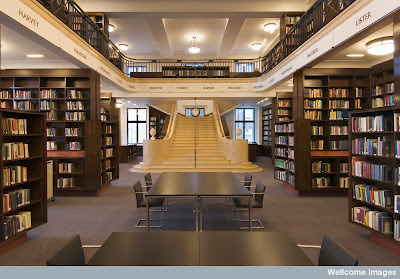 The Wellcome Library is incredibly lucky as it is privately owned and very wealthy. The majority of the Wellcome Trust’s budget goes towards funding medical research, but there is still a generous amount left to continue to acquire material and to move ahead with ongoing digitisation projects. Lady Strachan and Lady Warwick making love in a park, while their husbands look on with disapproval. Coloured etching, ca. 1820.